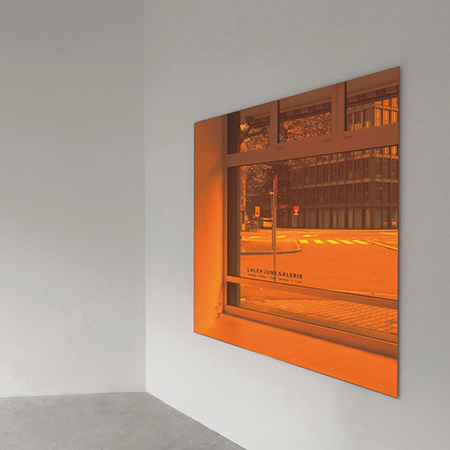 Marc Rembold, Orange Diamond, from the Mirror series, 1983–2016. Mirror, 160 x 160 cm, unique. View of Marc Rembold, Less is More, Mirror series, Laleh June Galerie, Basel, 2017. Courtesy of the artist and Laleh June Galerie. © Marc Rembold. Laleh June Galerie is pleased to present Less is More—Mirror series—by Marc Rembold. Marc Rembold’s exhibition borrows its title from Ludwig Mies van der Rohe (1886–1969): “Less is More.” The German-American architect, he is widely regarded as one of the pioneers of modernist architecture. The Swiss artist among other oeuvres of the architect, has a personal fascination with the Barcelona Pavillon (1928–29) by Mies van der Rohe. In this exhibition Marc Rembold challenges the dialogue between mirror and his innovations with colour, changing how the spectator can play a key role. His five mirror works play with the reflections of the glass, like Mies van der Rohe’s Barcelona Pavillon. For press inquiries, visual material and any further information please contact the gallery at info [​at​] lalehjune.com or at T +41 61 228 77 78. The Laleh June Galerie was founded by Laleh June in 2008. The gallery is located in the center of Basel City, in one of the most historical places, in Picassoplatz, between Rhine and the historic old town, steps away from the Kunstmuseum Basel. The central concern when establishing the programme was to create a white space for Swiss and international contemporary art in Basel City. Laleh June Galerie was set up to promote, represent and invite artists to Laleh June Basel. Since its inception, the gallery mounted exhibitions of work by Swiss and international artists work painting, drawing, photograph, sculpture, video, installation, sound installation, performance, new media and new technology.